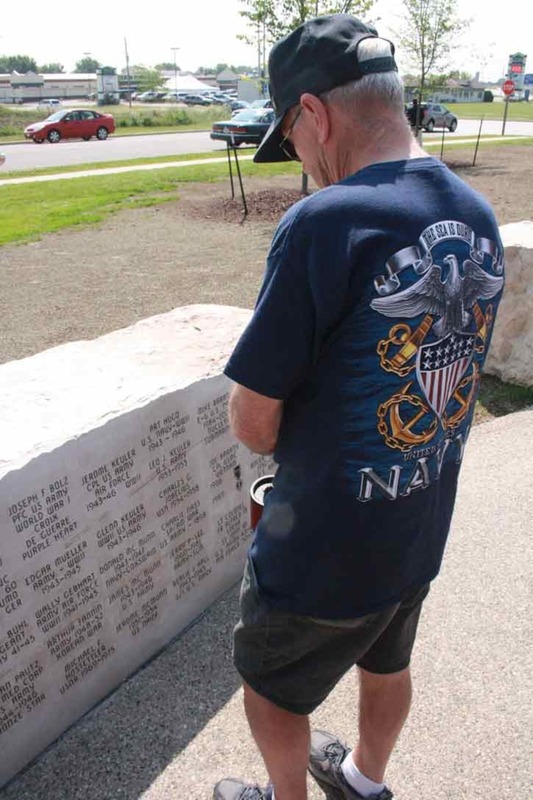 The signup period to add veteran’s names to the Veterans Memorial at Chilton’s Klinker Park begins Tuesday, Nov. 1. Applications to add new names to the stones at this outstanding Memorial setting will continue for a period of four months, ending on March 1, 2018. The process is relatively simple. An application form must be completed. Forms are available at the Chilton City Hall administrative office, the Veterans Service Officer’s office at the Calumet County Courthouse or can be downloaded by clicking the link below. To use the website, simply scroll to the bottom of the site and you will find a blue bar. Click on the “memorials” spot and a printable form will come up. Plaques are available in two sizes. One contains three lines of 13 characters on each line and costs $100. The larger form contains six lines for text or images and costs $175. If the veteran being honored has earned a medal such as the Purple Heart or Bronze Star, the larger form is required. And in those cases the application must be accompanied by a document certifying the award such as the DD214. If unavailable, that form can be obtained from the Calumet County Veterans Service officer at the courthouse in Chilton. Because of the complex sandblasting process needed to etch the names in the polished stones, new names are added only once a year. Timing of that event will be announced but the hoped for date is Memorial Day. Maj. Gen. Daniel Ammerman shares remarks complimenting Chilton’s efforts to honor those who have served. 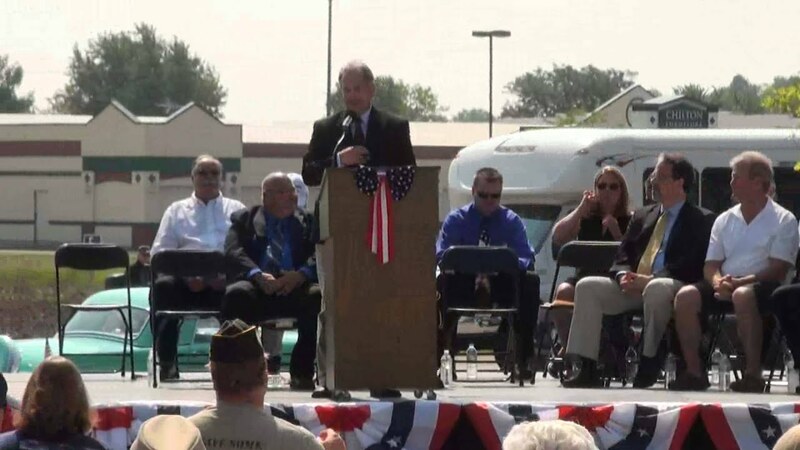 Chilton gathered as a community Saturday, Aug. 2, 2014 to write another chapter in its praise, admiration and respect for veterans of US military service. An estimated crowd of 1,000 people packed Klinkner Park to honor the dedication of the community’s new Veterans Memorial—a gem that honors past service and keeps the door open to honoring future service to preserving America’s freedoms. Speakers were joined by the combined Chilton bands and choirs, who celebrated the day with music. In addition to military personnel and veterans, the park was dotted with civilians who represented families honored on the memorial, and civilians who were part of the effort to raise money for the memorial. Maj. Gen. Daniel Ammermann, the commander of U.S. Army Civil Affairs & Psychological Operations, based in Fort Bragg, NC, addressed the crowd on this special day. “I applaud all of your efforts. I am impressed to see the way the community has come together, bringing money, resources and ideas together for this purpose,” he noted. “This is far from finished,” he said. “It is a work in progress, and as the years pass, more men and women will answer the call to serve their country. This park will grow as their names are added,” he said. Maj. Gen. Ammerman said that as long as there are enemies out there that don’t understand the importance of life, liberty and the pursuit of happiness, such sacrifices will be required. He closed by presenting a plaque of commemoration to the City of Chilton on behalf of the Joint Chiefs of Staff. 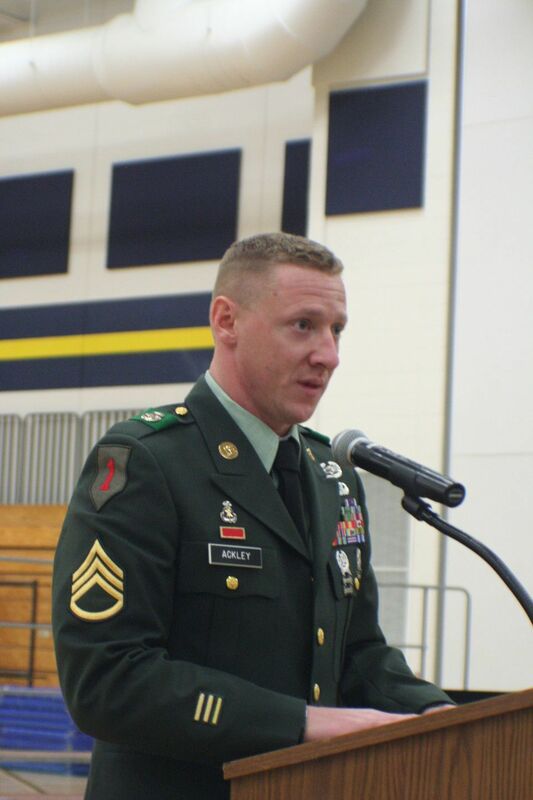 Rich Appel, US Army Lt. Colonel (retired) was introduced as the chair of the ad hoc committee that worked on the project the past two years. 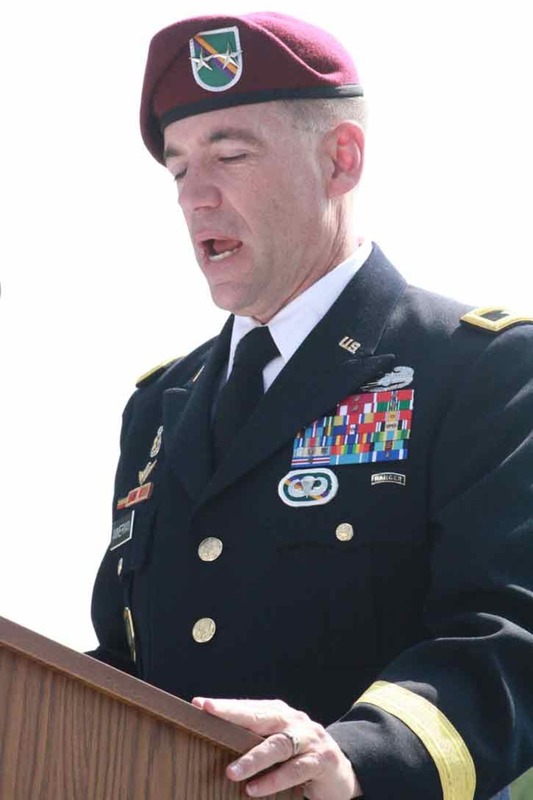 Appel also offered kudos to Command Sgt Major Tom Walsh of the 432nd Civil Affairs Battalion for answer the call to particpate in the dedication service. Appel called attention to the many donars and contractors who took part in the project, and to the community, whose support for the effort was immeasurable. Joining Appel on the project were Don Kampfer, representing the Veterans of Foreign Wars: Kent Katalinick, American Legion; Don Gehl, Disabled American Veterans; Bill Krizak, Calumet County Veterans service officer; Shawn Reilly, Kim Mckeen, Rick Nelson, Lee and Vicki Roehrig, members at large. Glen Calnin, State Bank of Chilton, served as the project’s treasurer. Jim Suttner, a Chilton native, was introduced as the memorial’s architecutral designer. He didn’t seek out the opportunity to design the memorial. It sought him out. He described how his father, John, and friend Don Kampfer explained to him on a pheasant hunting trip that they had offered his services to create the concept of the memorial. “I didn’t know what I was getting into at the time, but it turned out to be one of the most special things I have done in my career,” Suttner said. “I tried to think of what the the community has given to make this possible, but even more so what those who have served have given,” he added. Suttner said he wanted the memorial to serve as a daily reminder for all who pass by of that very service. “The design invites people to come inside the memorial and see the names and the numbers of people who have served—those who have given their lives and those who have served and understand and appreciate what that means,” he added. Suttner said he hopes the design fill a special purpose for the memorial to serve as a place to honor, to remember, to learn, to reflect, to share stories and as a place for community to come together—and never forget. “I hope that’s what happens with this place over the years to come,” he said. Mayor Gerald Vanne offered a salute to all veterans of service, citing their bravery and service. He thanked them for their patriotism and love for country. Mayor Vanne thanked the veterans memorial committee for its hard work, and he congratulated the community for ocming together to support the project. “Without the generosity of so many businesses and families, this amazing veterans memorial would not have become a reality,” he said. “The greatest dignitaries here today are the veterans themselves. Without their devotion, we would not have the freedom to stand here today for this great dedication,” the mayor added. 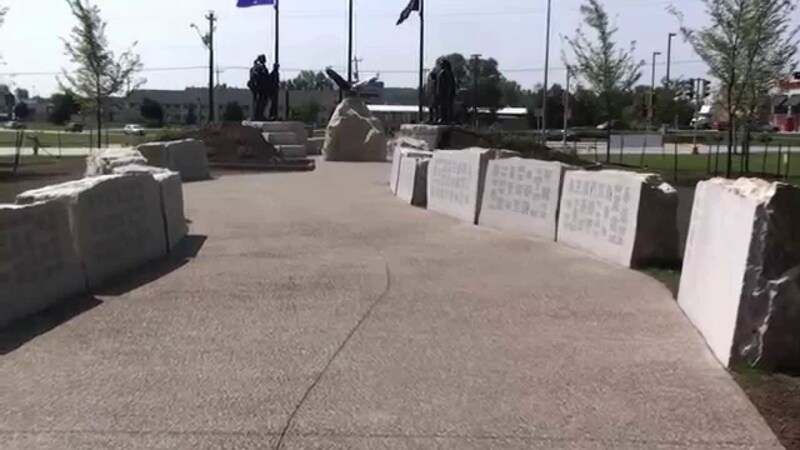 After the dedication of two wreaths and the playing of taps, officials cut the ribbon to the entrance of the memorial and opened it to viewing by the community. The throngs of people took their turns, reading the names, admiring the sculptures and taking pictures for the opportunity to remember the day. August 2 will go down as a day of remembering for Chilton. Saturday, August 2 was a day like any other day.It was an ordinary day for most. For a couple of hours on a beautiful Saturday morning in August, life in Chilton was anything but ordinary. Where the lawn of Klinker Park had stood idle and empty only a few short months ago, a new place of honor had been carved, shaped and now dedicated. As a community, Chilton donned its highest sense of patriotic and community pride to humbly honor those who have dedicated themselves to the service of our nation. As Mayor Gerald Vanne himself said, it was so important a day, that the community would see the rarity of him donning a suitcoat. Without question, Saturday was a red-letter day in Chilton. With the ceremony to dedicate its new, breath-taking memorial to veterans of our military service, the community smiled collectively. Together, they knew that this was their way of saying the most important word that could ever be uttered to those who have served. In its own quiet way, the simple “thank you” has now been converted into a roar that will greet the community as it goes about its every day business. Visitors who come to Chilton will know immediately how this community feels about its veterans and its nation. It is almost impossible to relate the significance of those who spoke at the ceremonies. Emcee John Maino offers his incredible respect for veterans, having sought them out in endless community visits. Major General Daniel Ammermann represented the US Armed Services and presented a plaque to Chilton from the Jt. Chiefs of Staff calling to attention the community’s efforts. Rich Appel, Chilton educator and retired US Army Lt. Colonel, stood as the representative of the community effort. His leadership and example spanned both side of the memorial symbolism. He has served his nation in wartime, and he has honored others who have served with his leadership in peacetime. Many in the crowd fought back tears as numerous residents from Chilton Care Center - Veterans of World War II and the Korean Conflict were wheeled into the ceremonies escorted by members of the Appel’s former unit. Respect and admiration flooded the park upon their arrival. Make no mistake, the dedication of this memorial was not a one-day event, or a one-time tribute. As designer Jim Suttner shared, Chilton has created a special place that is connected to the past, yet holds a place for future honor and remembrance. It will be a place, he said, where the community can come to honor, to remember, to learn, to reflect, to share stories and as a place for community to come together—and never forget. This new veterans memorialwill not only be a symbol of those who gave to the service of this country. The memorial will stand for all time as a tribute to those who can come together to appreciate the service of others. This project, was, after all, the culmination of two years of diligent planning, work and fundraising. Fundraising will be ongoing. You could hear and feel the heartbeat of a nation strongly in Chilton on this grand and glorious Saturday—an ordinary, yet amazing day in which a community offered something truly extraordinary for all generations to appreciate. 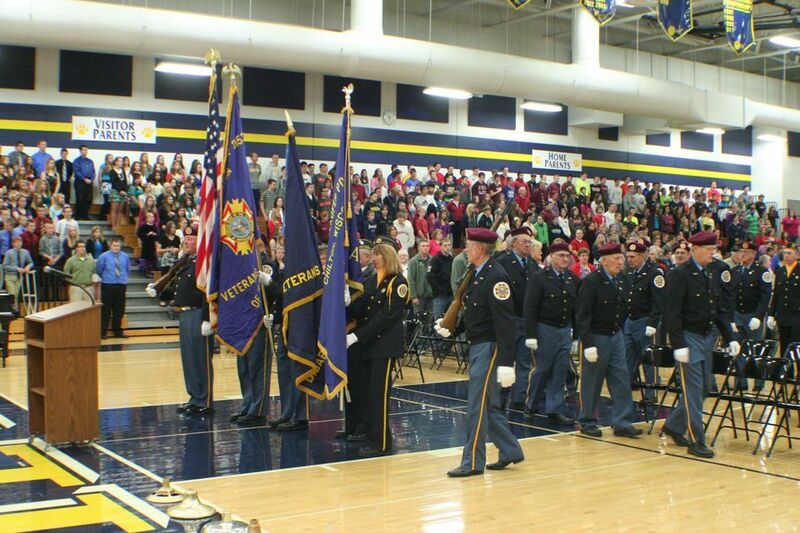 What a way to say “thanks” to our veterans. Kudos to all who contributed in any way to this amazing project. Because of the Memorial’s striking excellence, interest in honoring more veterans remains high. Veterans names can be added to the Memorial, and will be done according to the following guidelines. 1. New names will be added to the memorial once a year. The next update will be in May, 2015, probably somewhere near Memorial Day. The annual signup period to get your veteran included on the Memorial runs from November 1 through March 1. 2. Application forms to add names are available at the Chilton City Hall, the Calumet County Veterans Service office at the County Courthouse or they can be downloaded from this website be clicking on Memorials in the blue bar at the bottom of the site. 3. The cost is $100 for a four by eight-inch plaque with contains three lines, each with 13 characters. A second option, twice as large, costs $175, and is eight by eight inches with six lines of text. If a medal of valor such as a Purple Heart, Bronze Star, etc. is requested, the large plaque is required along with documentation that supports the request, normally the DD214 form available at the Veterans Service Office. Prices could change in the future. New prices will be clearly shown on the application form. 4. Proceeds after the expense of the etching process will be placed in the maintenance fund. This is the recently completed Veterans Memorial in Chilton Wisconsin. It really turned out beautiful. My hat's off to those who designed & worked on the project. You should all be very proud of yourselves. It's a fitting tribute to our veterans, Thank you so much.